1. Simply put, there is no greater value on on inflatable stand-up-paddle (SUP) board in the U.S.A! Our pricing is based on selling direct to the public or through wholesale outlets which keeps our pricing WAY below our competition. Our Saturn boats, rafts, and kayaks have been using the drop-stitch core technology in the construction of our infltable floors for over 20 years. Most all inflatable SUP board manufacturers are using this technology but we are one of the very few with the experience and history capable to maximize product quality. 2. Our paddle boards offer the same or better quality and use the same high-quality materials and workmanship. For our 2014 models we have even upgraded to Leafield C7 valves which are the highest quality valve on the inflatable boat market. Our SUPs have higher end features that often found in boards over twice the price. Why pay more? See the bottom of this page for a technical and cost comparison on other inflatable SUP boards. 3. 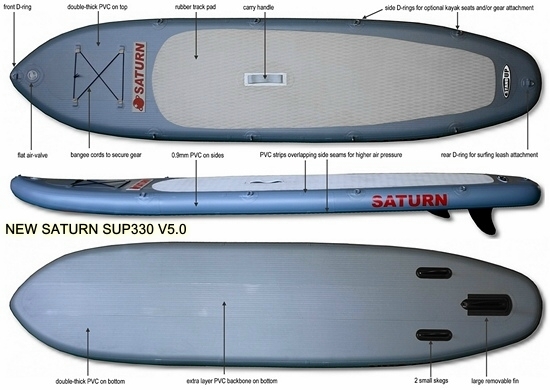 Saturn offers a 2 year warranty on our inflatable SUPs, while most other brands only stand by their product for 1 year! 4. Saturn was first in the industry to offer paddleboards for sale made of 140mm (6") thick drop-stitch fabric, while most other SUps on the market are made of 100mm (4") thick. That is almost 30% more air volume and is a huge reason why our boards are more bouyant and track better than other boards! It also supports much heavier weight loads. 5. Saturn was the first in the industry to offer inflatable boards with side D-rings that allow attachment of kayak seats which convert the paddle board into a sit-on-top inflatable kayak! 6. FULL Money Back Guarantee! Try a Saturn on water for 14 days. If you don't like it, send it back for a refund. The Superior Series Offers Two Products For the Price Of One - Inflatable SUP & Kayak! Our inflatable SUPs have set of D-rings on both sides of the board for the attachment of surfboard leash, or optional kayak seats, to use this board as a sit-on-top kayak. Remove the seat - and you have a SUP paddle board; install kayak seats and you have a sit-on-top kayak for 1-2 persons that is fast and easy to paddle. It is a great fit for river conditions and allows SUPing through calmer stretches and kayaking through the rapids. It also makes it much easier to ride the ocean surf! The Saturn inflatable SUP series is easy to ride and allows paddlers of all skill levels, including beginners, to enjoy a stable, comfortable ride while getting a moderate workout. Stand-Up Paddle Boarding (SUP) can be done in the ocean, harbors, rivers and lakes. Carry bag, repair kit, Bravo hand pump. SUP Paddle Included ($80 value). Remove and discard gray 3-pc adaptor attached to black hose of hand pump. That is generic set of adaptors supplied by pump manufacturer, and that is not needed for paddle board inflation. Instead, insert provided black valve adaptor into the hose, and place 2 rubber seals on that adaptor. Please make sure you read instructions attached to the hand pump chamber. Apply oil or grease to rubber seals inside pump and aluminum handle. New Bravo RED pump included with newest SUP boards automatically switch from double action to single action.